Practical Action engages in policy and practice influencing to contribute to long-term positive change for poor people. Why? Our projects and knowledge work reach vast numbers of poor people directly as well as indirectly and contribute to improving their lives. However, without achieving change to the policies and practices of governments and other development actors, our direct impact would remain comparatively small given the scale of technology injustices and inequalities that prevent poor communities to build on their skills and knowledge to achieve a sustainable world free of poverty and injustice in which technology is used for the benefit of all. At the centre of what we do are our thematic change agendas which we developed with our colleagues working on the ground. They contribute to our organisational vision of technology justice whilst clearly articulating the changes we believe need to happen in the sectors we focus on i.e. energy, agriculture, DRR, and urban services. Our change agendas also include our ambitions related to gender, markets / private sector and climate change and have been directly informed by what we know and have expertise in. 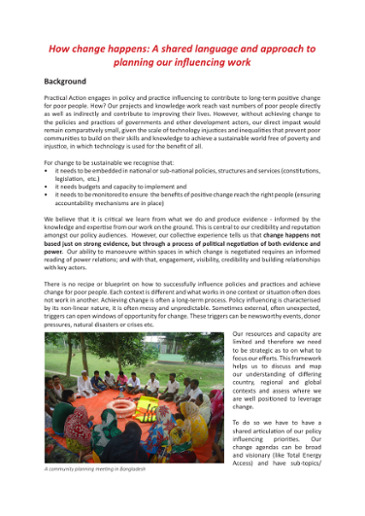 To achieve policy and practice change we influence key actors to remove barriers related to access, innovation and sustainable use of technologies and to enable participation of poor people in decision-making processes. We engage in global and regional policy processes to help inform and leverage change at national levels. We believe that it is at national and sub-national levels where change is most likely to have the most profound and sustained impact on poor people’s lives. We know that we cannot deliver national, let alone global changes to policies and practices on our own. Thus, we work closely with other civil society organisations, governments, universities, UN agencies and many more. What we bring is expertise that comes from our work on the ground. We do not have a blueprint, or a one-size-fits-all approach to our influencing work. Depending on context and opportunity we might choose to play one or indeed as many of the following roles as we can: being inside informants, advocates, facilitators, networkers and alliance builders to name but a few. To guide us through and help us plan our work we have developed a framework that helps us asks questions and focus our efforts. It is based on experience and intended as a guide that provides us with a language and vocabulary to discuss, plan and prioritise our efforts. We call it “How Change Happens”. The framework (and our practice!) is about what Duncan Green calls joined-up programming and advocacy. We feel we are in a good place but continue to strive to do more as well as better. Practical Action is known for decades of providing knowledge and evidence that is grounded in the work we do with poor people. Our influencing work continues to be evidence-based and we invest in strengthening our learning and knowledge continuously. However our experience tells us that change happens not simply based on evidence but through messy political processes and is dependent on our ability to build relationships with a whole range of different actors. We take a relational approach to influencing which we believe is important to understand and navigate complex systems and power relations. So, whether you are a policy maker, a development practitioner in an NGO in head office or with muddy boots in the field, a private sector company or simply someone who is interested in what we do and how we do it, please read our thematic pages for more details and get in touch if you would like to discuss or engage with us.